A tohai (mountaineering pilgrimage) to Mt. 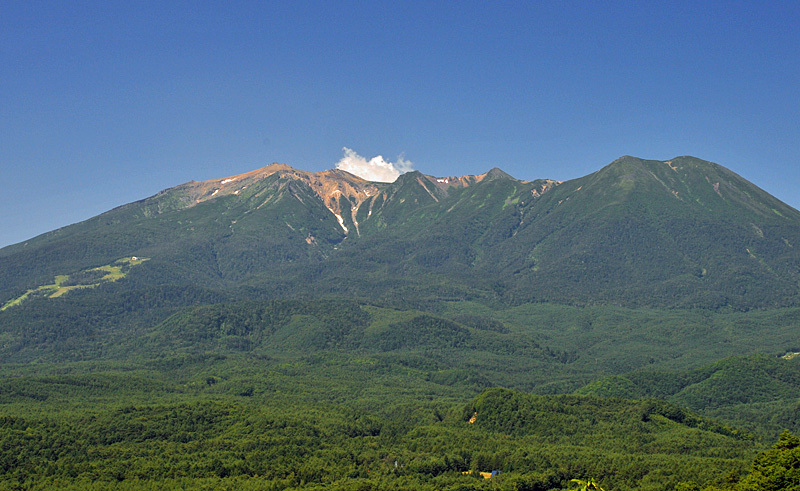 Ontake is a journey to sacred places that sendatsu (pilgrim guide) and pilgrims experience together. It can also be characterized as a back-and-forth trip on which to experience and ponder about contrasts: daily life and the extraordinary; life and death; the Earth and the celestial world; or the sacred and the profane. For the duration of the pilgrimage, the participants make a clean break from their ordinary worldly lives and throw themselves into the spatial world where a sacred, completely different flow of time presides. The harsh natural environment challenges you, and in it you are embraced by a sacred world. Surrendering yourself to something far bigger than yourself and realizing that you are not living, but rather, are allowed to live, is a spiritual expedition of self-rediscovery, and at the same time a self-healing retreat. The mountain holds plenty of both natural and spiritual elements: crags to climb, precipitous cliffs, clearest water springs and a diverse range of plant-life; and, all across the mountainside, a great number of deities are enshrined. Pilgrims wear a traditional white ensemble to make the journey. During the summer season, people come from all corners of the nation to make their pilgrimages, which begin right from their doorsteps. A few decades ago, when this kind of spiritual journey was at its peak, it is said that more than 300,000 people made their pilgrimage to Mt. Kiso Ontake in a single summer. The largest number of people to climb Mt. Fuji in recent years was 320,000 in 2010. This brings some perspective to how many pilgrims Mt. Kiso Ontake has drawn and continues to draw from all over the nation. How each kou (pilgrimage group) designs their route and timing to visit this holy land varies slightly among them, depending on the founder of the group or their subject of worship, but each group sticks to its own original route every year. Prior to their climbing the mountain, they never fail to conduct a deity-invocation ritual called “oza”, during which they receive divine messages and dedicate their prayers to following the deities’ intentions. The primal destination for the majority of kous is the summit, where the highest deity or deities are enshrine, or given a specifically-designated space in which believers can pray being far-distant from the summit. The hallowed ground of secondary deities is an optional destination, and those of the third level of deities onwards are visited only by especially devout sendatsus and a few congregations. A pilgrimage climb (tohai) of Mt. Ontake is not merely a mountain climb to challenge your physical boundaries, but an ascetic practice done in order to visit various spaces created and protected by people who worshipped and put a lot of faith in this mountain throughout history. There, you encounter and interact with the deities and deepen your faith in the nature that surrounds you. It’s a time to really feel and remember how our lives are, and have always been, in the presence of the divine. There are currently several tohai routes available. I believe it’s the shortest route to the top of the mountain – which includes a road for vehicles that reaches the 7th station, the route from the Tanohara Tozan-guchi entrance – that attracts the largest crowd. During summer, the parking near the entrance point is packed with climbers’ cars and buses hired by various kous from across the nation. If you’ve been there, you probably noticed that the rest house (tourist center) and the Tanohara Lodge stand very close to the entrance. The gentle slope you see in the background here is that of Mt. Mikasa, a prominently important subject of worship. This mountain enshrines the Buddhist deva called “Tavatimsa”. With Mt. Mikasa behind you, pass through the large Shinto torii gate and you will be welcomed by the wooden bridge-like walkway over Tanohara moor. You will find few more torii gates on your right as you head toward Mt. Ontake, as well as a shrine which has the large stone monument of a five-yen coin. This is Tanohara Daikokuten, the place where Daikokuten (Maha kala, the god of wealth) is enshrined. Many passers-by stop to put their hands together there to pray for the blessing of wealth. The slope gets gradually harsher from around the “distanced praying space”, where there are three copper statues of Mt. Ontake’s three deities. This distanced praying space is an important place for those people who would find it difficult to progress further, such as the elderly, as this will be the place where they pray to the mountain as they see it far in the distance. The gradient sharpens further after this point, bringing you to the shrine of the deity Ooe-Gongen. From here onwards, no women were allowed until the early Meiji era (19th century). This is where the route becomes a real mountain track. Above your head are spread the needles of acicular trees, but soon the moderate green slope becomes red with the color of rocks, and you find an almost-collapsed valley on your right-hand side. The valley is known as “Akappage” (“the red bald”) and walking alongside it takes you to an open field where several small temple buildings are lined up. You will discover many statues donated by people who participated in kous here, enshrining, for instance, Kondo-doushi (Kani-Krodha) or Zaou-Gongen. This was where the ancient pilgrims changed their straw sandals to new ones to signify the freshening of their minds and clothing before heading to holy Mt. Ontake. Continue climbing up the ridge to reach the stone chamber which probably protected many people from harsh circumstances during their climbs, thereby saving their lives. This is currently called the 8th station of the mountain. From here, the rocky trail now forms steep stairs. The gradient is so sharp that you need to hold your spirit up to move forward one step at a time. A formation called “Fujimi rock” beholds you from one side, and after 10 min. walk from the rock you arrive at the 9th station. Walking further, with the dry valley on your left, you reach the only spot where you can access spring water: Hitokuchi-mizu (“one sip water spot”). If it’s after August then there is unlikely to be water, but if there is still snow here there might literally be enough to take just one sip. Between here and the 9th station is another lofty climb. Past the stone chamber of the 9th station, the trail branches off into two paths, one leading to the summit, the other to the oku-no-in (the innermost shrine). Take the path to the summit and walk 5 min. and you find yet another small shrine, this one in honor of Fudo-myoo (Acala Naatha in Sanskrit). Look up to the summit and you might see the summit lodge in the far distance, but you will need to climb quite a bit more to get there. Since the 2014 volcano eruption, there are many sections for which entry is still restricted, and many built structures are going through restoration. The scars from the natural disaster are vividly noticeable and you will still find many bouquets left at various spots to mourn the passing of the deceased and to pray for their peaceful rest. Around the summit is particularly raw, still bearing many “No trespassing” tapes and all the structures including shrines heavily damaged. Anywhere within a 1km radius of the eruptive crater is off-limits, and there is no projection of when the restriction will be lifted. But this doesn’t change in any way how all the enshrined deities protect the pilgrimage routes from various spots inside the mountain. If you get to climb this very special sacred mountain, you will be able to have a sincere interaction with these beings, even if you don’t get to put your feet at the top of the mountain. Your knowing the history of this holy mountain should immediately bring you to something sacred, something special, and your putting hands together for that will connect you to this divinity. Where these deities really reside, in my opinion, is in those people who have chosen to live at the foot of the mountain through the centuries, and who still choose to protect and guard the mountain even in light of the tremendous volcanic hazard, as well as in those who worship the mountain and come together spiritually and physically to visit the site in the name of their faith. Mt. Ontake is not just a mountain. It evokes a powerful image, and remains standing along with its many timeless deities. Once again, as I write this article about this special mountain, I would like to express my sincere condolences to those who lost their lives there in 2014. What we were reminded of by the volcanic disaster was profound and fundamental, and I myself hope to carry that remembrance with each mountain I step upon, each personal tohai I make, throughout my life.